You enter the email of the BrandChamp you want to add a referral discount code for and the public code that they will share out with their followers. The "Tracking ID" field is only required if you are adding referral discount codes from Amazon. Otherwise you can leave blank . Technical note: when we synchronize a referral orders from Amazon, it's the tracking ID and not the public code, that's included with the order details. So that's why you need to enter it. 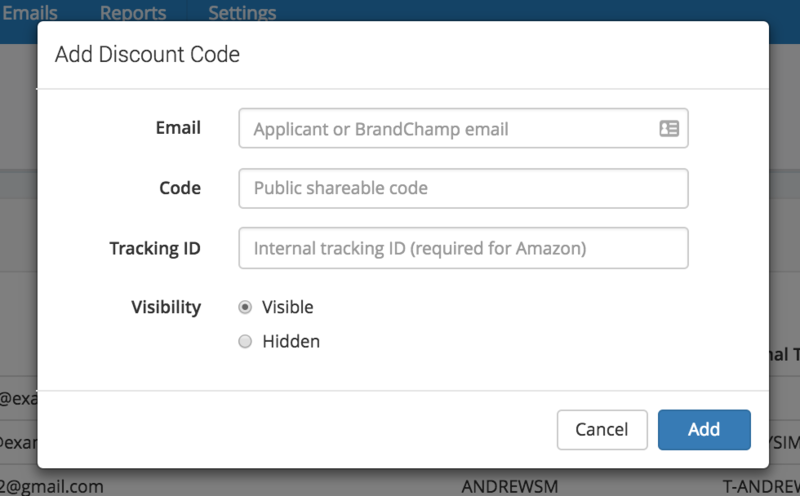 The visibility controls whether the BrandChamp sees the referral code in their portal. You should aim to only have 1 visible code per BC. If you have assigned a referral discount code to a BrandChamp but then later want to change it, you should mark the original code as hidden rather than deleting it so that the system can still pick up referrals linked to the original code. Once it's hidden, the BrandChamp won't see it in their portal. Then, add in a new, visible discount code as a replacement. When you create a Shopify referral Activity Type, you can also add a "Referral Tracking Link Definition". This sets up a trackable link that you want people to visit, such as the home page of your e-commerce store for example. The system then uses that link and, for each BrandChamp in the system, adds a unique "referral code" associated with each BrandChamp onto the end of the link and runs it through a URL shortening service to create a unique, short URL for each BrandChamp, which they can share out with their followers. 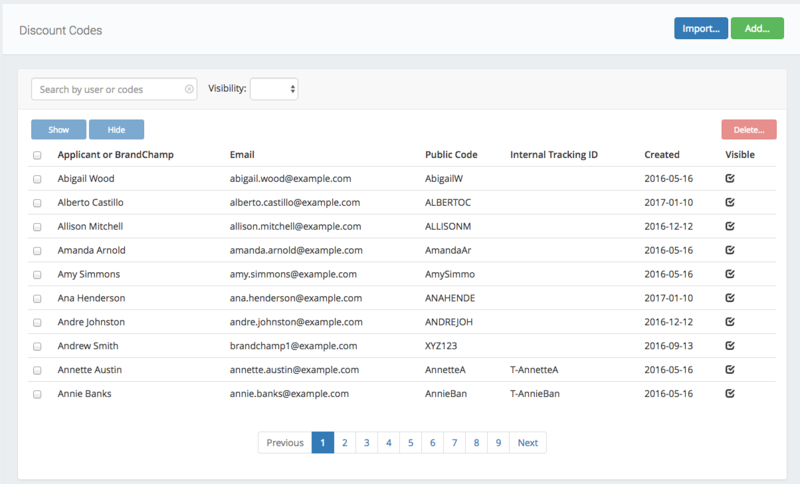 When one of their followers clicks on a referral tracking link, the system drops a cookie containing the BrandChamp's unique referral code so that any purchases detected in the next 30 days will be credited back to the BrandChamp associated with the link. Note: the length of time is configurable in the "Referral Cookie Expiry" field of your Shopify Integration settings. Which to use - Discount Codes or Tracking Links? If you have the choice of using referral discount codes or referral tracking links, then in general it's better to go for referral tracking links as they require less work to manage and referral discount codes can sometimes make their way onto coupon sharing sites and may require you to rotate them regularly to avoid this issue. You can also combine both options if you like (if an order comes in with codes from both a referral discount code and a referral tracking link, the credit will go to the BrandChamp associated with the referral tracking link).